How fast time flies. I remember just about 1 year plus ago, I was hesitating about taking this gamble, whether to take up or not. The dilemma was that what if I could not adapt this place or I could not get along with the colle@gues? If these obstacles were there, the only way out of here was to Pay. Return every cent of money spent on me through this program. Thank g0d that I've survived my first year quite happily, though I did have some negative thoughts at certain period of time. Ever since I finished my Scho0l, the blog entries I have written are mostly related to work, and my dearest department ppl!!! Although some of them, I have not touched on at all, I do like them. Just that I have already taken their nice for granted already. There are many benefact0rs here. I hope things remain as they are now at present. And I changed to my present 4th cubicle seat. My first cubicle was at a very old place for 2.5mths. I thought I like my place. But no, when I changed to 2nd place. 2nd place is at newer office. It was so far the seat with most privacy as I was isolated and backfaced a wall, no one could see what was on my laptop screen. I stayed there for 5.5mths. 3rd place is near 2nd place. . 3rd place was bad! Though it was a convenient seat, it was too exposed. Everyone going to pour himself some water could see what I was doing. Damn. I spent about 5 mths there too. 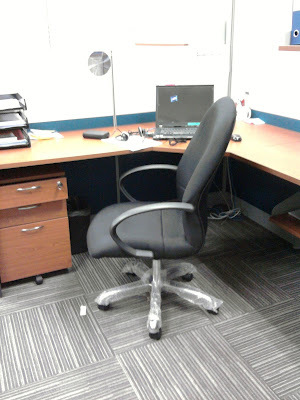 4th seat... new office, new desk, new cubicle walls, new chest of drawer, so cool. I am so not used to sitting together with my department colleagues. As my 2 previous seats were not v near to them.It a matter of getting used to. The pic!